There are a few things more annoying than checking the tires on your vehicle only to find one that is losing air steadily. One of the reasons that this can be so frustrating is because it means that you have to haul your car in for repairs. This can be quite time-consuming and, depending on how much your local garage charges, costly too. The good news is that you don’t have to actually bother with professional work if the tire isn’t majorly damaged. With a tire repair kit on hand, you can deal with the problem yourself. Of course, for you to actually be able to fix up the puncture efficiently, you need to have one of the best tire repair kits available to you. If you aren’t all that sure how to differentiate the good from the bad, we are here to help. In this guide, you will find all the information and suggestions that you need to make the right choice for you. Prior to looking through all the options available to you, you should first understand the features that make certain tire repair kits superior to others. Tool Options: now, a kit is only as good as the tools that it contains. While this doesn’t necessarily mean that you need a large number of tools, the kit should have all of the tools that you need to fix your tire up properly. 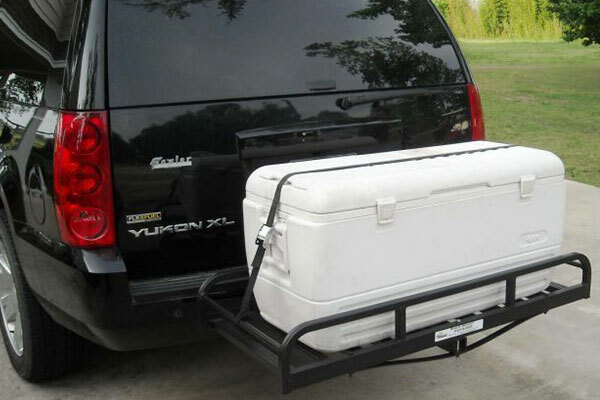 Versatile:you should look for a kit that is able to work with all kinds of tires for a multitude of vehicles. This way, regardless of what you are driving, you will be able to fix the tire in a flash. User-Friendly:there is a good chance that you don’t have too much of experience with cars or how to fix them. This is why, ideally, the kit should be easy to use. There should be instructions that would allow even a novice to fix a tire. The Case:although you may not think so, it is important to take a look at the case as well. After all, the tools need to be properly arranged so that you can quickly and easily find them when you need them. 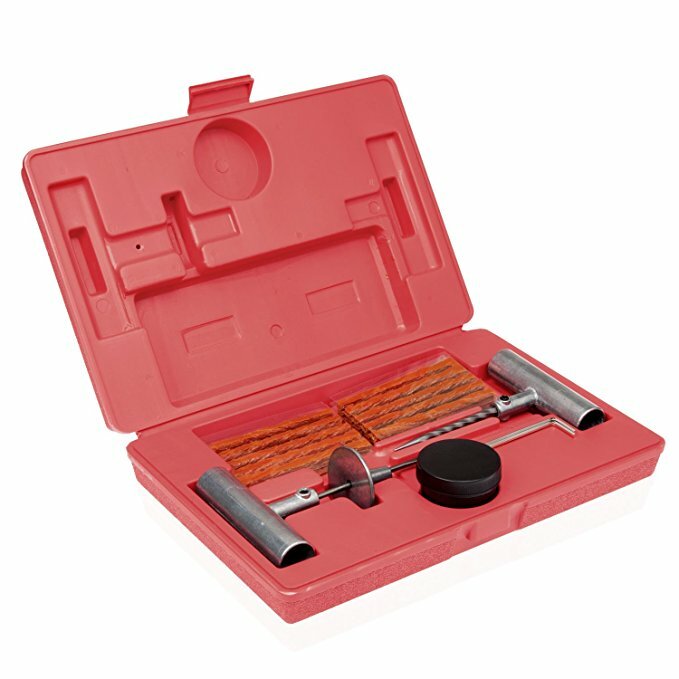 Why we like it: The Safety Seal KAP30 Tire Repair Kit is a good quality case that is easy to use, even by novices. At first glance, this kit can seem rather sparse. After all, it only has a handful of tools in it, not including the string plugs. Still, you will be pleased to know that you won’t actually need anything other than what is provided in this kit. All the tools can be utilized to deal with most of the minor tire problems you may encounter. The only downside is that this is a rather pricey kit, considering just how few tools there are. If you don’t really know your way around cars, this kit will be a good fit for you. This is largely because it comes with an excellent set of instructions. So, even if you have never fixed up a tire in your life, you will find that you will catch on quite quickly. Also, because you don’t have to sift through too many tools, you will soon learn the progression of steps, making you a pro in no time at all. The other advantage of this repair kit is that it is well-suited to a variety of vehicles. So, whether you have a car, truck, or all-terrain vehicle, you will be able to deal with any issue that comes your way. You should even find some success trying your luck with tractors and similar vehicles. 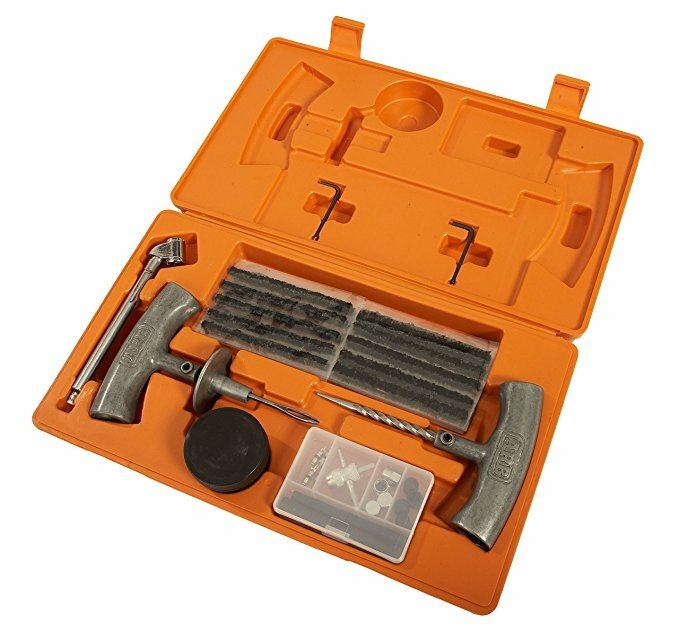 The tools and the case in this kit are constructed from high-quality materials. Due to this, you can be quite sure that they will last you quite a long time, making this a worthy investment. The sturdy materials are also what makes this kit useful for all sizes and widths of tires as well. Why we like it: The Grit Performance Tire Repair Kit contains everything that you need to ensure that you fix up your tire properly. There are 71 pieces in this repair kit. So, as you can see, there are more than enough tools to make sure that you can get the job done. 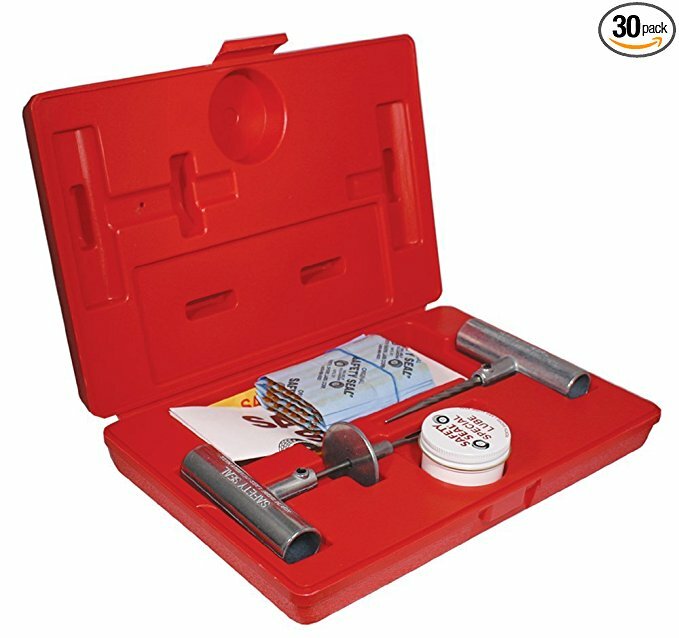 Not only will you be able to fix punctures in the tire, you can even manage valve maintenance with this kit. You really will be able to keep the entire tire system in good condition. One of the standout features of this kit is the tire pressure gauge. So, once you are done, you can be certain that the plug is holding and that the tire isn’t losing any more air. The kit even comes with gloves so you really don’t need any other tools if you have this collection with you. The tire repair kit is equipped with a set of detailed instructions that are complete with pictures. So, while there is a learning curve involved, with a little bit of practice, you should have the whole thing down. That being said, this kit may be geared more towards those who have some experience with fixing tires. Otherwise, you might find yourself getting a bit confused by all of the options available to you. As long as a vehicle has a tubeless tire, you will be able to use this kit to fix it up. This means that you will be able to work on cars, trucks, SUVs, trailers, tractors, ATVs, and more. 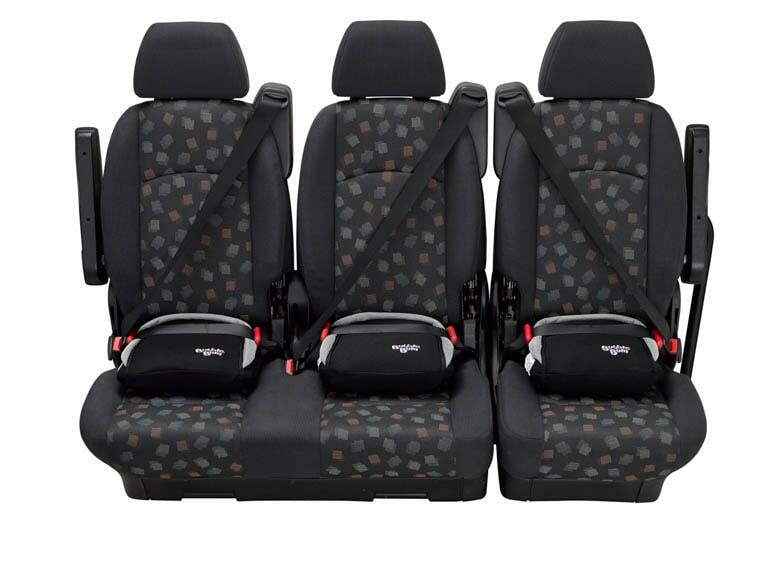 So, whether you want to keep it in your vehicle or at home, it is sure to come in handy for you. All of the tools are made from good quality materials so they are sure to last you quite a while. The case is similarly sturdy so there will be no problems with you lugging it around everywhere that you go. Why we like it: The Boulder Tools Repair Kit contains a considerable number of tools, all of which can be used to fix a flat tire on practically any vehicle. There are 56 pieces, in total, in this kit. 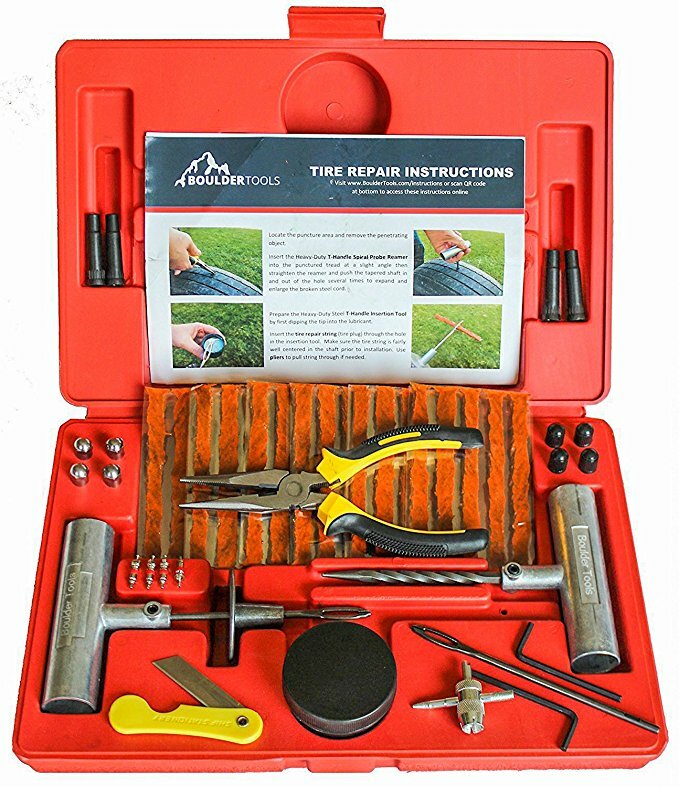 If you are someone who likes to really delve into a repair job and make sure that it is taken of properly, then this is the kit for you. You will find everything that you need and more to fix many issues related to a flat tire. All of these tools are also what ensures that you will be able to do more than just temporarily fix the issue at hand. You will be able to plug up the hole completely so that you can actually use the tire for quite a while after that. So, this kit will help you to save money in the long run as well. This tire repair kit comes with a set of easy to understand instructions that are even accompanied by pictures. So, even if this type of repair isn’t something that you are used to, you should be able to figure it out rather easily. Because all the tools are ergonomically designed, they are also simple to grasp and use as well. The only minor issue with this repair kit is the plugs. They are overly sticky, which can make them difficult to manage, particularly when trying to pry it away from the plastic that it is stored in. It doesn’t really matter what kind of vehicle you have, this kit should help to repair it as long as it has tubeless tires. This includes all kinds of cars and even farm equipment like tractors. If you are someone who enjoys heading off-road in heavy-duty vehicles, then this kit will definitely come in handy. All of the tools in this kit are very solidly built which is good news for anyone looking to use them on thicker or larger tires. The case is similarly of good quality and likely to last a long time. 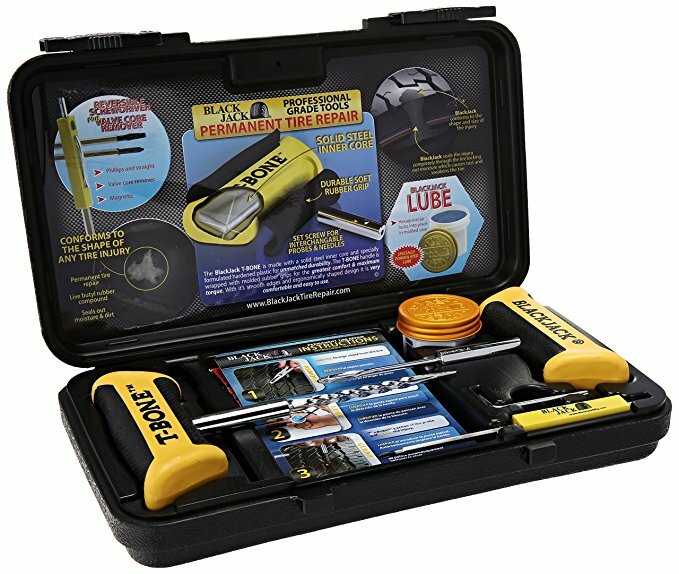 Why we like it: The Tooluxe 50002L Universal Tire Repair Kit is a simplistic yet functional kit that allows you to quickly fix most flat tires. If you are looking for a repair kit that you can use in an emergency situation, then this is definitely it. See, there aren’t too many tools with this kit. In total, there are four tools, not including the lubricant and the string plugs. However, it is due to this, that you will be able to work quickly with this tool. While there are only a few tools, they are the only ones that you really need to fix up your tire. So, it will be a fairly quick process until your tire is all fixed up again, even if it is only temporary. Even if you are a novice at fixing tires, you will find that this kit is fairly intuitive. This is good considering that there are no instructions available with this kit. So, you will need to find other directions before using the kit. The tools, however, have been designed to be comfortable and easy to use. The tool grip design means that you will be able to hold it better and be able to use more power. Despite its minimal number of tools, this kit will work with a number of different vehicles. As long as they are tubeless tires, you will find that you should be able to fix punctures and flats without any problem at all. One of the things that really makes this kit stand out is the incredible quality of the tools. They are made of hardened steel and are sandblasted as well. This makes them a good choice for heavy-duty vehicles and also ensures that this is a kit that will last you a longer time. Why we like it: The Smittybilt 2733 Tire Repair Kit offers you everything you need to fix a punctured tire in a nice, compact container. 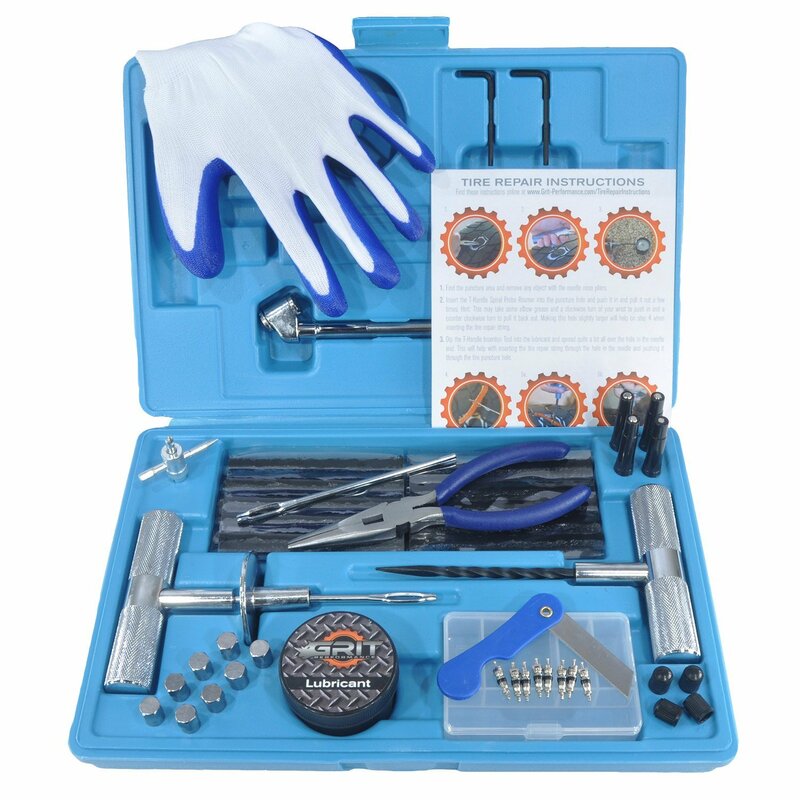 If you want to quickly repair a flat tire and not have to mess around with too many tools, then you will find that this kit is perfect for you. While it does have all the tools that you will need to fix a tire, you will not feel like you are overwhelmed with lots of bits and pieces. One of the items that are especially important in this kit is the dual headed tire pressure gauge that is actually quite accurate. So, once you have managed the repair, you can check whether the puncture has been fixed up as well as you believe. The only unfortunate thing is that this kit doesn’t have any lubricant, unlike many other kits. This is definitely one of the easier tire repair kits to use. First of all, there aren’t too many tools, so you will be able to figure out quite easily how to use the items that you have been provided with. On top of this, you are also given incredibly clear instructions which makes it a good fit for someone who doesn’t have a lot of experience with this type of fixes. The minor downside is that since there is no lubricant, you may have to struggle a bit when using the reamer. It will take some wrangling before it can be properly inserted. This kit will prove to be suitable for most vehicle tires that you may have to contend with. It works especially well on off-road tires so if you have a truck or similar vehicle that needs patching up, you will find that this is where this kit really shines. The tools in this kit are good quality so you should be able to use them for years to come, on multiple occasions and still have them in good condition. Why we like it: The ARB Orange Speedy Seal Tire Repair Kit is good for fixing tires of a variety of different vehicles, making it quite versatile. 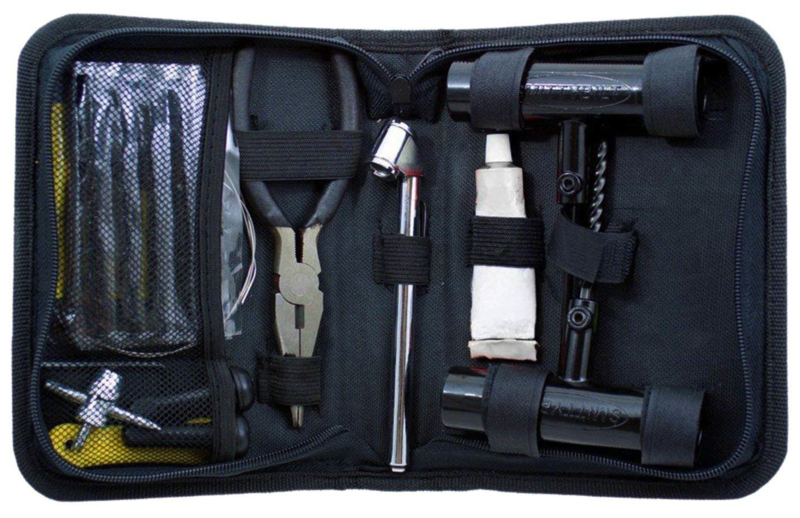 While this kit may look rather simplistic, it actually has all the tools that you need to fix up your tire. So, whether you are looking for a quick fix or want to take your time, this kit will allow you to opt for either method. One of the tools that you will definitely find useful is the tire pressure gauge. Using this, you will be able to see if the tire pressure continues to hold up after you have fixed the leak. This offers you an added bit of security. However, this kit is a bit overpriced when you consider how many tools some of the other kits have. You will find it easy enough to use this kit. As it has just the right number of tools, it will not take you long to figure out how to use each of them. The clear and concise instructions certainly do their part to ensure that you are able to fix your tire incredibly quickly. There is no denying that this is one of the more versatile tire kits around as it works on practically any tubeless vehicle you can imagine. In particular, you will find that it works especially well on off-road vehicles and in off-road situations as well. The tools in this kit are constructed from high-quality materials. This is what makes them especially adept at working on wider and thicker tires of off-road vehicles. The better quality is also what ensures that these tools can be used over and over again. Unfortunately, the same can’t be said about the case which is rather flimsy. 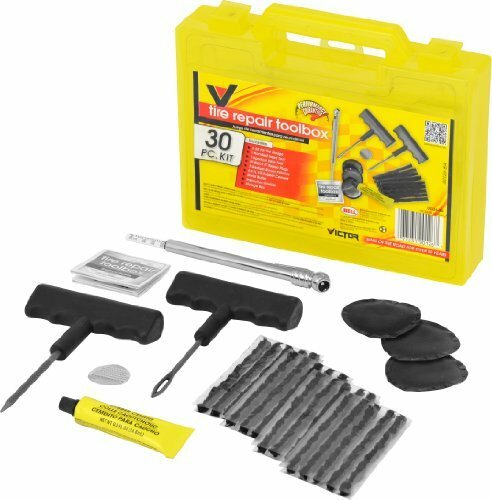 Why we like it: The Victor Tire Repair Toolbox is filled with a lot of different tools which ensures that you fix up your tire as efficiently as possible. This is certainly one of the more well-stocked repair kits on the market. It has everything that you need, without going overboard with any unnecessary tools. This means that while you are able to handle more significant repairs with this toolbox, they can also be done with very little fuss. There are some interesting components in this repair box. These include the pencil tire gauge and the rubber cement. The tire gauge allows you to check the air pressure of the tire while the rubber cement ensures that the puncture has definitely been plugged up. At first glance, some of the components in this repair box may appear to be a bit confusing. However, with the help of the concise instruction manual, you will see that it is actually quite easy to use this toolbox. Within just a short period of time, you will have the entire process down perfectly. The only minor issue here is that the string plugs are a little thick. So, if you are trying to plug up a smaller hole, you will first have to cut up the plug to be able to use it. This tire repair kit is useful for a number of different vehicle tires. From small cars to big trucks, you can be quite sure that it can handle it all. The size of the tools, in particular, ensure that you will have no problem trying to get through a really thick tire. The tools are made from good quality materials. So, there is a good chance that you can use this kit for years to come, over and over again. The tools are certainly built for it. Why we like it: The Blackjack KT-340 Tire Repair Kit is a heavy duty kit that is not only durable but also works well with a variety of vehicle tires. Although it may seem like there aren’t too many tools included in this repair kit, you will find that there are just enough to help you fix a tire. All the necessary components are present, which means that you will be able to fully repair your flat in no time at all. This is a good kit for anyone who is looking for something simple to use but effective. Not only does this repair kit fit this definition perfectly, all the tools are also encased in a container that is well-organized and easy to work with. There really isn’t too much of a learning curve involved with this repair kit. As there are only the essential tools, you will figure out how to use it very quickly. The instructions, of course, are really useful and make it even simpler for you to use all the tools that you have been provided with. This repair kit works with most of the vehicles that rely on tubeless tires. So, you should have no problem using it with car and truck tires. Now, this kit undoubtedly contains some of the most durable tools. They are constructed using heavy-duty materials and have been designed to withstand continuous use. So, you can be quite certain that this is a kit that will last you a long time. You will also be able to use the tools over and over to plug up various tires. Now, all of this means that you will have to pay a higher price and this repair is a bit pricier than the others. This can be unjustified as it doesn’t contain nearly as many tools as some of the other kits. Why we like it: The AllTools Tire Repair Kit is perfect for anyone looking for a compact kit with interesting tools to boot. 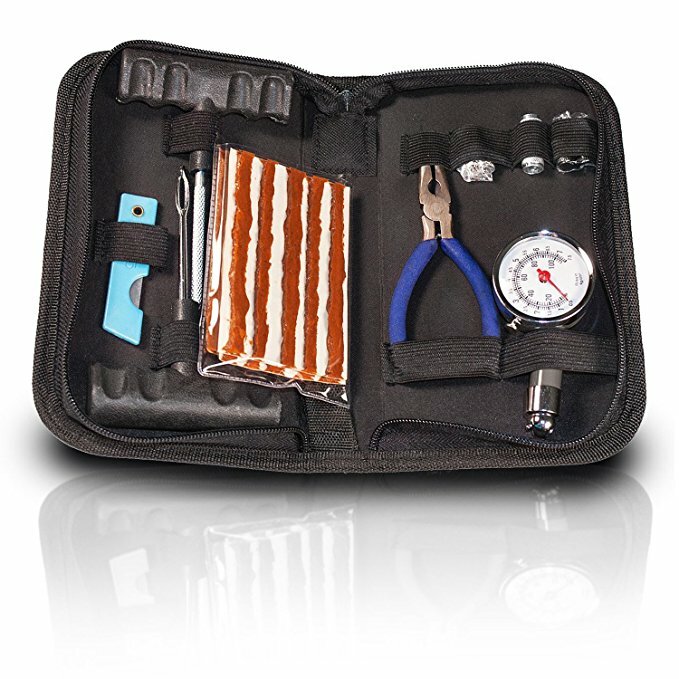 If you want a tire repair kit that can easily be stored away, then this is the one for you. It is incredibly compact and can be taken with you wherever you go. Despite its smaller size, though, you will find that it contains all that you need to fix up your tire. In fact, it has a few interesting components such as a tire gauge and replacement valve as well. One of the more useful components is the plugs which are available in different sizes, though. This way, you will be able to easily plug up holes of all sizes, without having to whittle down the plug or double up on the number of sticks. The instructions that accompany this kit are very easy to understand, even if you have undertaken this type of task before. On top of this, there aren’t too many different kinds of tools to familiarize yourself with. So, you shouldn’t have too much trouble figuring out just how to use this kit to your advantage. If you just want to keep an emergency tire repair kit around, then you will find that this is one of the most useful to have. This is because it works with most of the tubeless tire vehicles. This includes cars, trucks, ATVs, jeeps, and even motorcycles. So, whatever tire you are hoping to fix, you are sure to be able to do it with this kit. The main downside with this repair kit is the durability of the tools. While they are of decent quality, it is unlikely that they will live up to their heavy duty description. So, you will need to be careful with them. 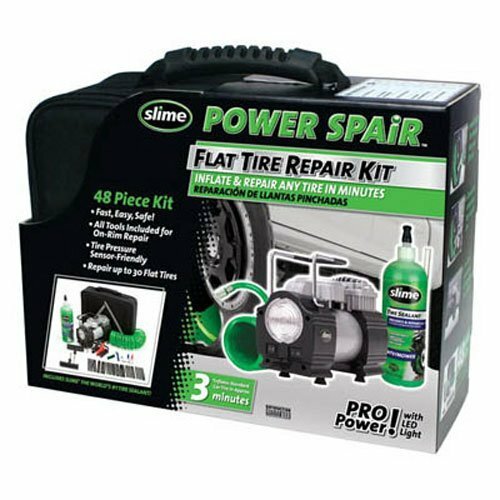 Why we like it: The Slime 70004 Power Spair Tire Repair Kit is ideal for anyone who wants a more efficient and thorough fix for their flat tire. 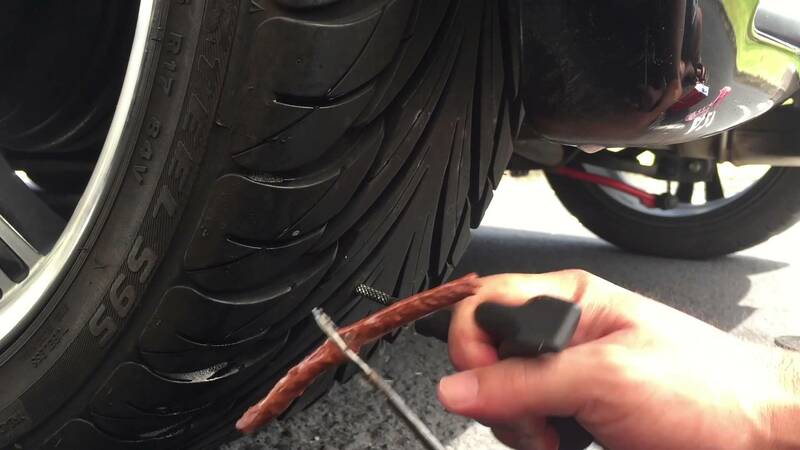 The reason that this tire repair kit is so useful is because it does more than just plug up the hole. Now, of course, it does do this part of the process quite well. You are provided both with plugs and patented slime to make sure that the hole is properly fixed and will not be leaking more air. There are also plenty of other components you can use to plug up the hole as well. However, where this repair kit really stands out is that it is equipped with a tire inflator as well. It can inflate your tire from 0 to 35 psi in a matter of minutes. So, even if your tire has been deflated rather significantly, you will still be able to re-inflate it and then start driving again. The only issue is that the standalone gauge in this kit isn’t all that reliable. While all the components in this kit may sound rather daunting, they are actually quite easy to use. You get many of the same tools as you do with any other repair kit and instructions alongside them to show you how to use them. As for the inflator, it is just as easy to use as it can be plugged into your cigarette lighter. Of course, you do need to be careful as it does require a 15 amp to avoid any damage. You will find that you are able to use this kit on a number of different vehicle tires. Provided that they have tubeless tires, the kit should fix it right up. 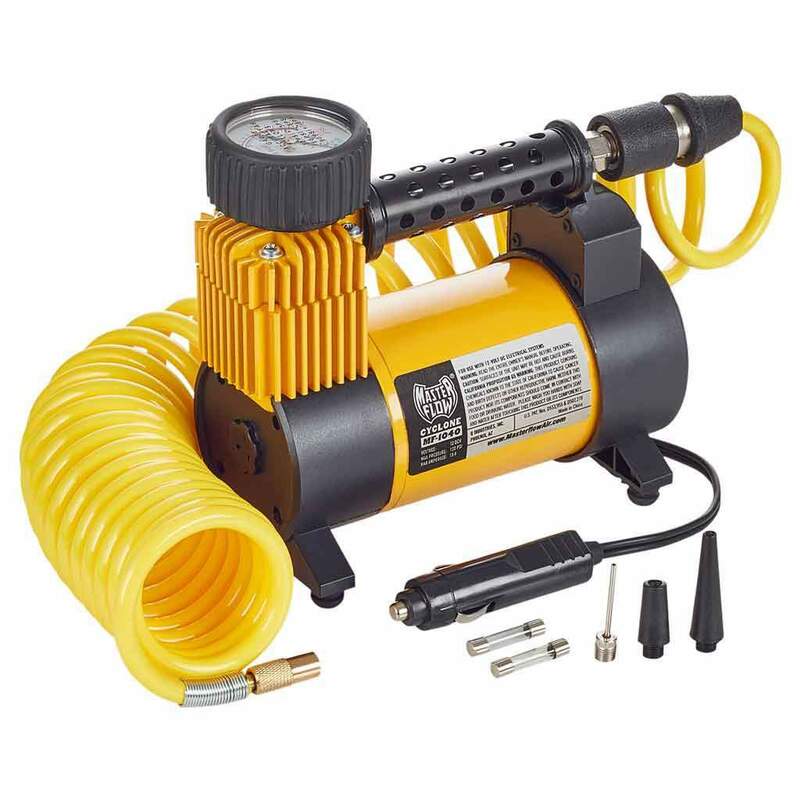 There are certain components on the inflator like the hose that isn’t all that durable. At the most, you can expect it to last for a year before giving out. This really depends on what you want out of a tire repair kit as well as how much you are willing to pay for it. In most circumstances, the slightly higher priced kits will contain a greater number of tools for you to use. Of course, this isn’t a hard and fast rule, as kits are also priced according to quality. What’s most important, though, is how much effort you are willing to make to patch up your tire. Depending on this, you can determine just how many tools you will need. For instance, if you just want a quick fix until you can find a repair shop, then an insertion tube, spiral probe, lube, and plugs are all that you really need. If you want to make certain that your plug will remain in the tire for quite a while, especially if you need to drive a greater distance or on rough terrain, you will require more tools. The number of tools can also depend on the level of experience that you have with cars. If you are rather handy, then you will find it easier to figure out how to work all of those tools. However, if you don’t really know what you are doing, fewer tools are often better. Since most people rely on these tire repair kits for emergency purposes, it is a good idea to look for a kit that works with different types of tires. For example, make sure that it is compatible with cars, trucks, and SUVs for most common repairs. If you tend to drive a wider range of vehicles, then look for a kit that will also work with ATVs or even farm equipment. If you are someone that tends to drive off-road and has off-road tires to boot, then you are going to require a kit that is able to pierce these thicker tires. So, you should always check that the kit is able to work with the kind of tires that you need it to. In most instances, though, it is just best to stick with a versatile kit so that you can be certain you are prepared for any emergency situation at all. When it comes to the tools in the tire repair kit, there are two aspects that you need to look at when trying to determine the durability of them. The first is the bottom part of the tool – the one that you will be inserting into the tire. Now, as you can imagine, this part needs to be rather strong to be able to penetrate the rubber. This is especially true for heavy-duty tires. So, it needs to be constructed out of thick, good quality metal. This will ensure that the tool will not bend or break when you press it into the rubber. The other element that you need to pay attention to is the handle – the part of the tool that you will be gripping. What most people fail to realize is that you actually put an incredible amount of pressure when you push down on the tool. This is why it is important to get a handle that is able to withstand this force. In most cases, you will find that steel or metal grips are better than plastic options as they are less likely to crack or break while you are using them. Now, the instructions are especially significant if you are either a novice at fixing tires or if there are lots of tools in your kit. In these instances, you are going to need all of the guidance that you can get. This is why you should always see if the instructions can be clearly followed. If you really aren’t too sure about what you are doing, then look for instructions with illustrations or pictures. This will give you a better idea of just how to use each of the tools properly. This, in turn, will ensure that the puncture is fixed up properly without doing any more damage to the tire. Now, when buying a repair kit, it is vital that you remember a few points. First, in most cases, these kits are simply a temporary fix. You may eventually need to go to a service center for a more permanent solution. Also, there are some problems like sidewall punctures that these kits simply can’t fix. This concludes this guide on tire repair kits. You should now be informed enough to make the best possible choice for yourself.